Off the Hook Meat Works in Whitehorse opened in 2012. Located downtown, the butcher shop operates out of a converted garage, processing both wild game brought in by hunters and selling locally farmed meats to customers in town through its deli counter. Owner John Pauch is “Whitehorse born and bred.” He says he started his business out of boredom and now considers his butcher shop to be the best in town. “I got all the business,” says Pauch. Originally from Waterloo, Ont., Hans Kolaritsch has been living in Whitehorse for decades. “Came here in 1979 and never left,” he says. Kolaritsch has been working at the shop as a butcher for about four years. Charging a dollar a pound, Off the Hook Meat Works offers cutting and wrapping services for hunters who come in with their own game. When it comes to farmer’s meats, the butchers process pork, beef and poultry that they sell in the deli. The shop processes both wild and domestic game, and sells fresh as well as smoked meats that they make in-house. Kolaritsch chops beef that came in from a local farmer. He says that they can only sell what farmers bring in, given that it needs to be federally inspected. Meat brought in by hunters is illegal to sell, so once they’re done processing, the meat is returned to the hunter for their personal use. Pauch says he made sure that the shop would be built in a way that made it easy for hunters and farmers to bring in their meats. 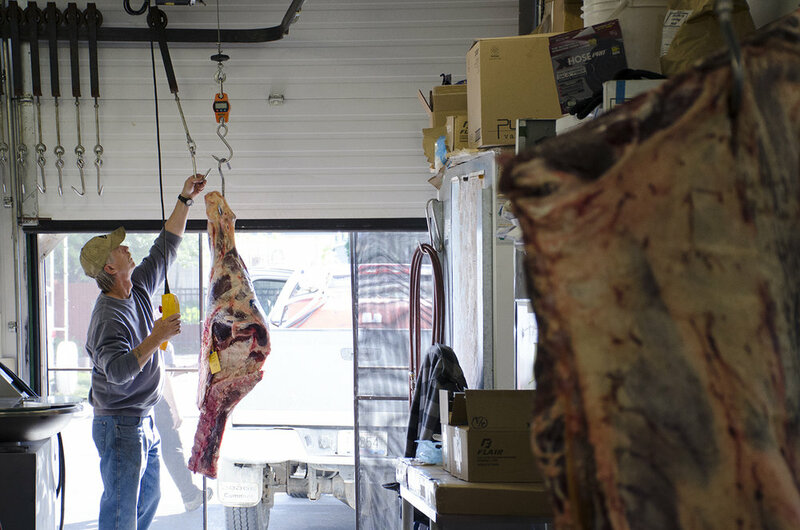 Trucks can come right up to the garage door, where butchers then latch the meat onto hooks attached to a track that carries the meat from the door all the way to the freezer. The freezer is roomy at the moment, mostly because the hunting season is not in full swing. Kolaritsch says August is usually the busiest time; the freezer is bursting with so much moose meat that they can’t even get through to the shelves at the back. 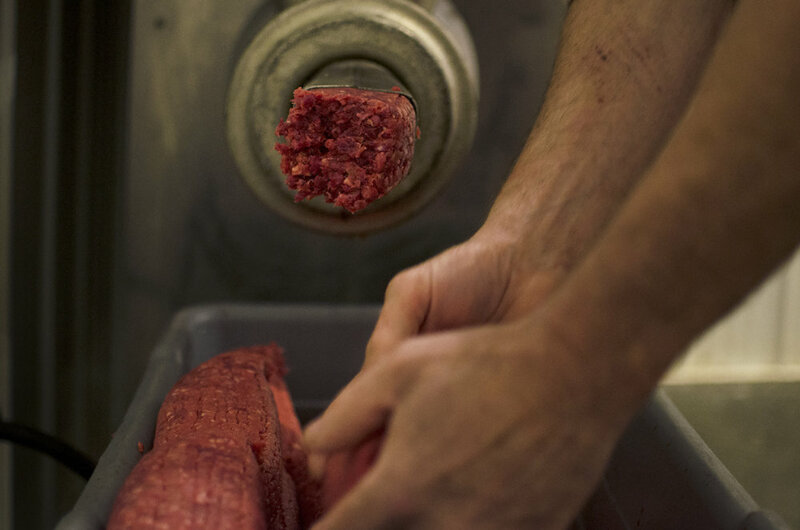 For Kolaritsch, grinding meat in the summer has its ups and downs. On the one hand, the grinding process equals freezing hands. But the cool air of the freezer is soothing during the rare times when Whitehorse experiences heat. Pauch and Kolaritsch always keep busy, but joking around is a normal part of the day. “It’s that sound again,” says Kolaritsch as the phone rings. Apart from calls coming in every now and then, the shop is buzzing with machinery and songs coming through the radio. Pauch says customers in Whitehorse enjoy both the variety of the meats and the selection of products. Made with wild and domestic game, their deli’s offerings include patties, ribs and even seafood. But the favourites are the shop’s sausages and jerky.